The government has approved the supply of equipment by Chinese telecoms firm Huawei for the UK’s new 5G data network despite warnings of a security risk. There is no formal confirmation but the Daily Telegraph says Huawei will build “non-core” components such as antennas. But Australia has already said it is siding with Washington – which has spoken of “serious concerns over Huawei’s obligations to the Chinese government and the danger that poses to the integrity of telecommunications networks in the US and elsewhere”. A spokesman for the Department for Digital, Culture, Media and Sport has said it is reviewing the supply of equipment for the 5G network and will report in due course. According to the Daily Telegraph, Huawei would be allowed to help build the “non-core” infrastructure of the 5G network. This would mean Huawei would not supply equipment for what is known as the “core” parts – where tasks such as checking device IDs and deciding how to route voice calls and data take place. 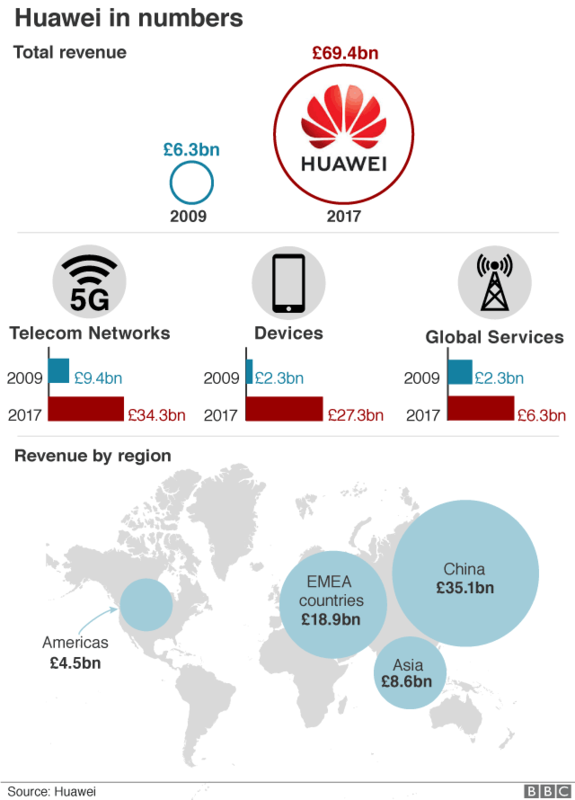 Huawei, a private company which already supplies equipment for the UK’s existing mobile networks, has always denied claims it is controlled by the Chinese government. 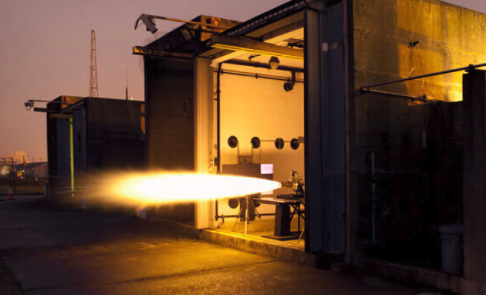 It said it was awaiting a formal announcement, but was “pleased that the UK is continuing to take an evidence-based approach to its work”, adding it would continue to work cooperatively with the government and the industry. Ciaran Martin, the head of the National Cyber Security Centre – which oversees Huawei’s current UK work – told BBC Radio 4’s Today programme a framework would be put in place to ensure the 5G network was “sufficiently safe”. The world is going mobile and existing spectrum bands are becoming congested, leading to breakdowns, particularly when many people in one area are trying to access services at the same time. 5G is also much better at handling thousands of devices simultaneously, from phones to equipment sensors, video cameras to smart street lights. 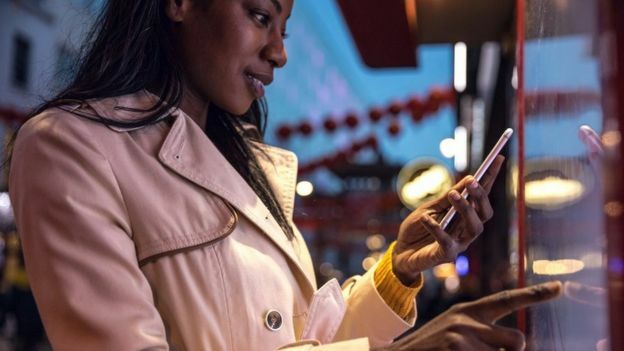 Current 4G mobile networks can offer speeds of about 45Mbps (megabits per second) on average and experts say 5G – which is starting to be rolled out in the UK this year – could achieve browsing and downloads up to 20 times faster. BBC security correspondent Gordon Corera says it is believed the decision to involve Huawei was taken by ministers at a meeting of the government’s national security council on Tuesday, chaired by Prime Minister Theresa May. The home, defence and foreign secretaries were reported to have raised concerns during the discussions. In a tweet, shadow Cabinet Office minister Jo Platt said using Huawei equipment would raise “serious questions” about the “government’s interests and how they will secure networks”. Foreign Affairs Committee chairman Tom Tugendhat tweeted that allowing Huawei to build some of the UK’s 5G infrastructure would “cause allies to doubt our ability to keep data secure and erode the trust essential to #FiveEyes cooperation”. Speaking on the Today programme, Mr Tugendhat said the proposals still raised concerns, as 5G involved an “internet system that can genuinely connect everything, and therefore the distinction between non-core and core is much harder to make”. 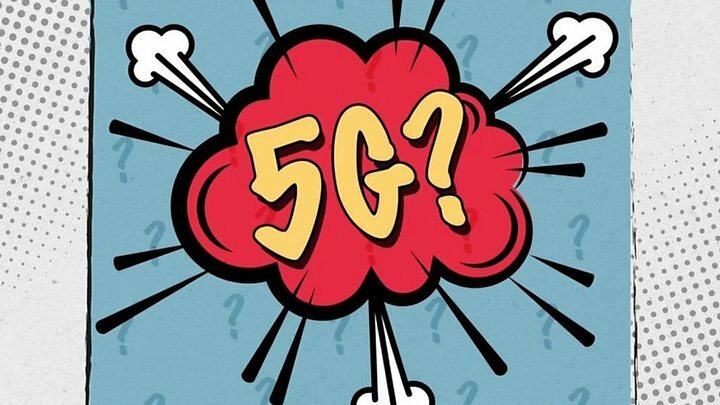 Joyce Hakmeh, a research fellow at think tank Chatham House and co-editor of the Journal of Cyber Policy, said the UK’s current mobile network needs to be transformed to the “the next level… quicker, more stable 5G”. But she added the government would be hoping its decision on Huawei did not upset either China or the US. Limiting – but not barring – Huawei technology from the 5G networks would be a “diplomatic way of managing a difficult situation” for the UK, said Ms Hakmeh. It did not appear that anyone was in the vehicle at the time of the explosion. A self proclaimed Tesla owner in Shanghai that Tweets under the name @ShanghaiJayIn posted video on his Twitter moments ago of what appears to be a Tesla Model S, 1st generation, catching fire spontaneously in a Chinese parking garage. We will be following this story and updating this post with further information, as it becomes available. Anyone who, like me, joined Facebook a decade or more ago, probably clicked “yes” when invited to upload all of their contacts. It seemed a good way of making the network more useful and, after all, what could be the harm? But after the various data scandals shattered trust in Facebook, we’ve become far more cautious. We’ve woken up to the harms that could come from handing over that precious information about our social connections – for journalists it could mean revealing their contacts, for whistleblowers their dealings with regulators, for just about anyone their contacts with people they might not want their partners to know about. To many, the idea that they should trust Facebook with their data seems more old-fashioned by the day. Contacts started being taken without consent in May 2016, the company told Business Insider, which broke the story. Before this date, new users were asked if they wanted to verify their identity via their email account. They were also asked if they wanted to upload their address book voluntarily. This option and the text specifying that contacts were being grabbed was changed in May 2016 but the underlying code that actually scraped contacts was left intact, said Facebook. Ireland’s Data Protection Commissioner, which oversees Facebook in Europe, is engaged with the firm to understand what happened and its consequences. The email contacts case is the latest in a long series in which Facebook has mishandled the data of some of its billions of users. 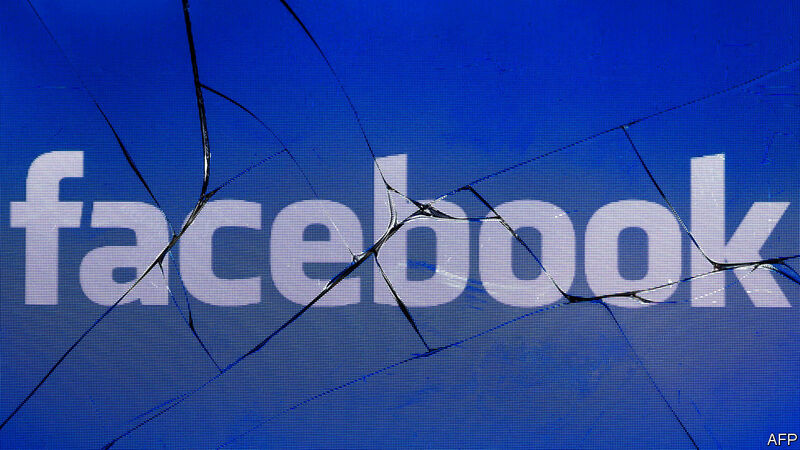 The ongoing breaches and other criticisms of Facebook are also prompting some high-profile users to bow out. 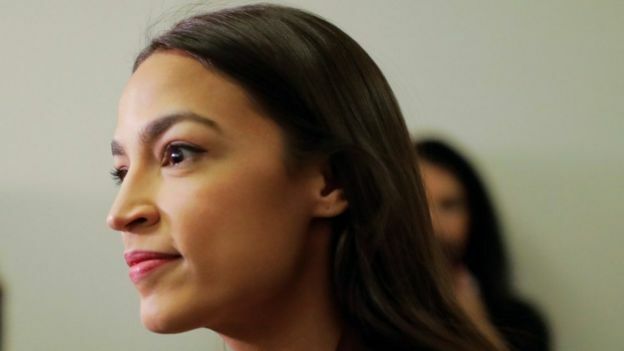 The latest is Democrat Representative Alexandria Ocasio-Cortez who said she had “quit” the social network. She added that social media posed a “public health risk”. (NBC) Facebook’s leaders seriously discussed selling access to user data — and privacy was an afterthought. Facebook has tried to clean up its act, shutting down tools which allowed advertisers to aim at Facebook users based on age, gender, and zip code. HUD is seeking “appropriate relief” for Facebook’s past actions nonetheless. HUD’s lawsuit also accused Facebook itself of discrimination against minorities through the algorithms it uses to run its advertising business. These are the same ones that Facebook uses to maximise click-throughs and views, and therefore revenue. A paper published on April 3rd by researchers from Northeastern University in Boston, the University of Southern California and Upturn, a Washington-based advocacy group, appears to add weight to HUD’s claim.The research team, which is led by two computer scientists, Muhammad Ali and Piotr Sapiezynski of Northeastern, concludes that Facebook’s own systems are influenced by the race and gender of its users when it presents them with ads. The research has not yet been through a peer-review process, but The Economist asked six experts in the field to comment on the paper’s results. All six said that it appeared sound. Mssrs Sapiezynski and Ali tested Facebook’s systems by paying for advertisements and observing to whom they were delivered. They provided hundreds of pairs of ads, each of which was identical in all but one characteristic. They found that, for instance, an ad with the same image was delivered to fewer black people if it claimed to refer to a property for sale rather than one for rent. They also show that the race of people depicted in images affected which groups were more likely to see the ads. An ad for cheap houses for sale, which depicted white families, was delivered to an audience that was 85% white. An identical ad that contained pictures of black families was served to an audience comprising around 73% white users. This suggests that fewer black people saw ads for cheap or affordable housing when those ads used pictures of white people. The researchers also found a disparity based on gender: jobs for supermarket attendants and janitors tended to be delivered to women, whereas ads for lumberjacks were more likely to be delivered to men. The research offers compelling evidence that Facebook is using “machine vision”, whereby powerful computers scan images and recognise what they depict. This is something that has long been assumed but never proven. The researchers established the use of machine vision by changing the transparency of the images they used in their ads, so that they were visible to machines but not to humans. Otherwise identical ads with different pictures of black and white families were still routed to different groups of people. Advertising relies to a large extent on trying to reach particular groups of people. Sellers of luxury watches want to sell to rich people, for instance, who are more likely to be white than black. But the ability of algorithms to reach the intended audience by sifting vast amounts of personal data is causing growing dismay. This is especially true of Facebook because of its scale relative to traditional media. Moreover, its advertising systems are too complex to be understood at a glance. This makes it harder to draw a clear line between ads that are clearly discriminatory and those than are merely discomfiting. 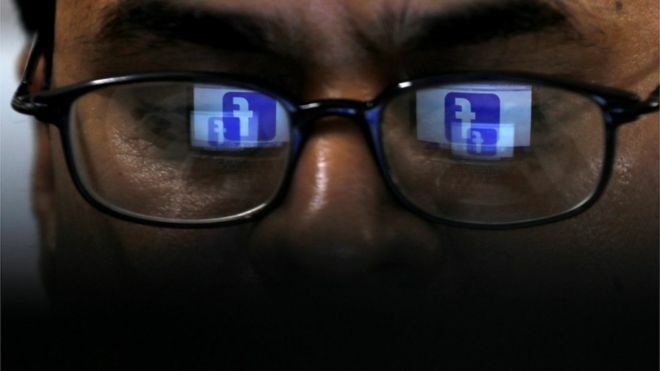 Christian Sandvig, Director of the Centre for Ethics, Society and Computing at the University of Michigan, said the research showed that Facebook is making “drastic, important, and potentially illegal editorial decisions all the time by using algorithmic systems to identify audiences”. Mr Sandvig was not involved in the work. The researchers take pains to point out that they are not making sweeping claims about Facebook’s entire ad-delivery system, given that they monitored its behaviour in only a few situations. There is no suggestion that Facebook designed its systems to discriminate intentionally. But its machine-learning software, in the process of training itself on the data of Facebook’s users in order to tailor ads to their interests, appears to have absorbed some of their prejudices. The worry extends beyond Facebook to all systems that rely on machine learning, including the majority of digital-content providers. “This paper is telling us that if your parents never went to college, it is quite likely that an algorithm will look at your pattern of clicks and associations and conclude that you are not interested in college. If you’re black, it will decide that you are less interested in buying a house,” says Mr Sandvig. Technology companies tend to claim that they are shielded from liability for these kinds of harmful effects. The Communications Decency Act states that digital platforms are not responsible for the unlawful behavior of their users. But the research appears to show that Facebook’s own systems are contributing to discrimination. The results throw doubt on Facebook’s claims to be blind to race, says David Garcia, a researcher at the Complexity Science Hub in Vienna, Austria. “Perhaps there is no table in the Facebook databases called ‘race’, but these results suggest that some race-related discrimination in advertisement is taking place,” he says. 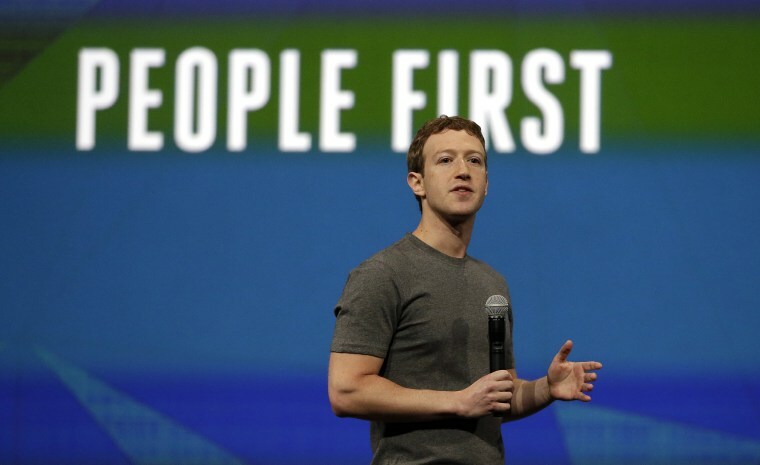 After two years of abysmal public relations, the research is another blow to Facebook. Last month Mark Zuckerberg, Facebook’s boss, tried to take back the initiative by calling for extensive regulation of digital-technology firms. He argued, for instance, that tech firms “shouldn’t make so many important decisions about speech on our own”. But he was noticeably quiet on the matter of Facebook’s advertising model. There, regulation may come sooner than he expects—and probably not in the form he is hoping for. “I don’t want anyone to be in any doubt that this is a top priority for the company,” Richard Allan, Facebook’s vice president for global policy solutions, told reporters over a video-link to Brussels. All such ads will be labeled as “paid for”, offering info on who bought it, for how much and how many people have seen it – broken down by age, location and gender. Only advertisers located and authorized in a given country will be able to run political ads or issue ads there, mirroring policies elsewhere where the tools have been rolled out. Ads will also be archived for seven years in a publicly searchable archive. 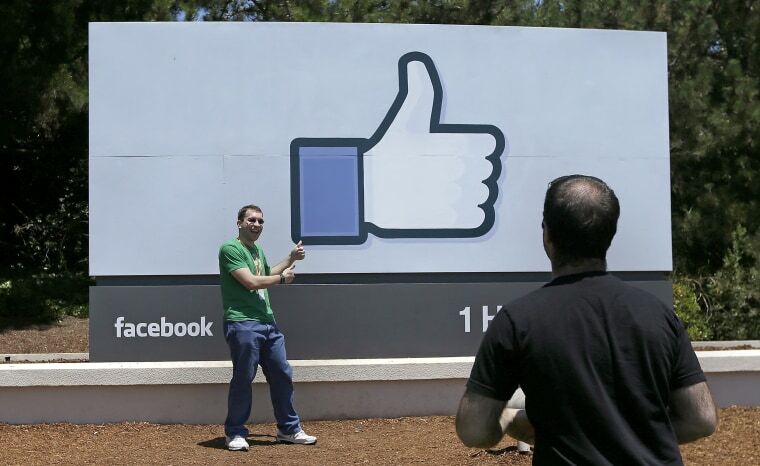 Facebook will block ads that fail to comply from mid-April. 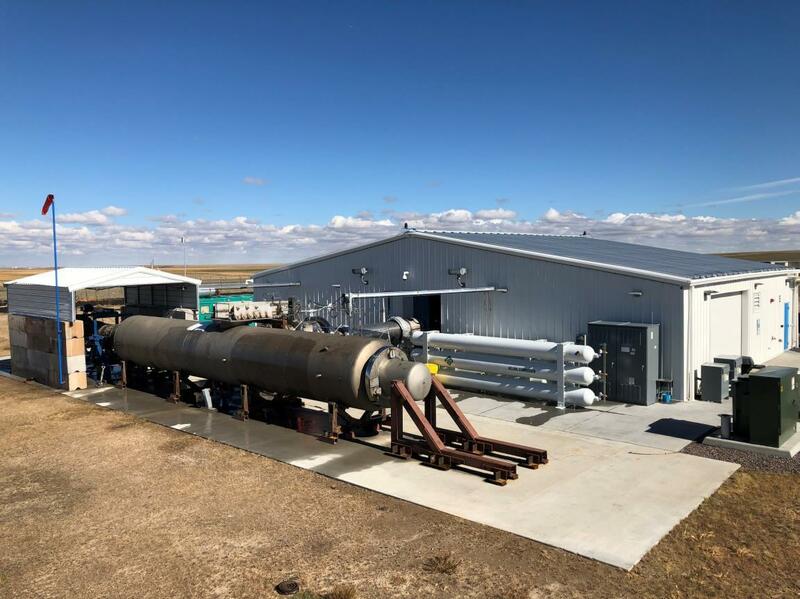 “The convenience … we understand why they want that, but we could not find any way to carve that out without opening up opportunities nobody would want to see,” Allan said. Doing so when polls in each of the 27 EU member states are governed by local election rules, he said, would allow little recourse for regulators in case of a breach of law. The ad transparency rules – already in place in the United States, Britain, Brazil, India, Ukraine and Israel – will be rolled out globally by late June, the company said. In the same update, Facebook said it was adding new features and information to its ad archive, the Ad Library, and expanding access to its database so researchers can conduct more in-depth analysis of the data. 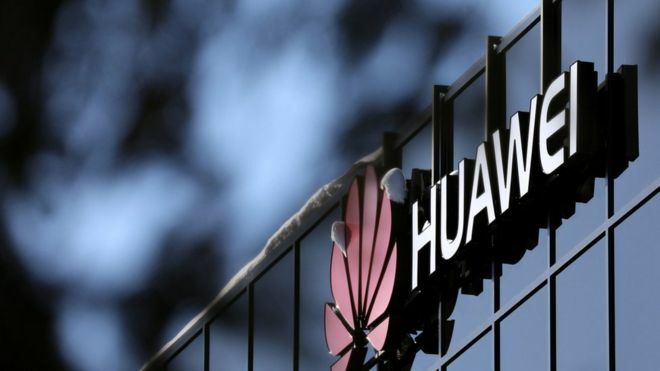 The government-led watchdog set up to vet Huawei products has given a damning report on the cyber security risks posed by the Chinese company’s involvement in the British telecommunications industry. The watchdog said Huawei had made “no material progress” in addressing security flaws identified in last year’s report and raised serious doubts about the Chinese company’s ability to deliver a $2bn programme to address concerns previously raised by the UK watchdog. 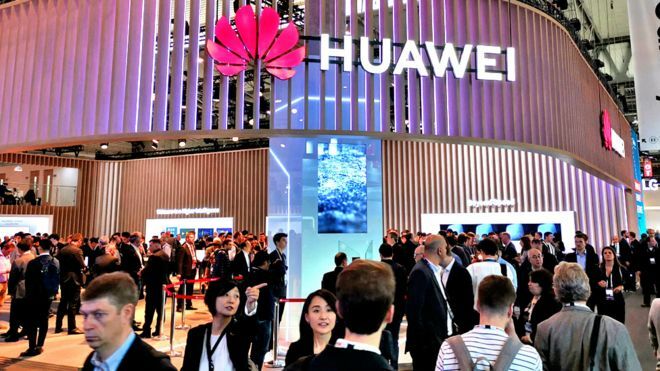 The report casts doubt on whether UK operators should be involved with Huawei over the future roll-out of telecommunications networks. “It will be difficult to appropriately risk-manage future products in the context of UK deployments, until the underlying defects in Huawei’s software engineering and cyber security processes are remediated,” the report said. The US has put increasing pressure on the UK and other countries to stop Huawei from being involved in the roll-out of future 5G networks. Countries including New Zealand and Australia have stopped Huawei from being involved, citing national security concerns. The report said that last year “several hundred vulnerabilities and issues” were reported to UK operators to inform the risk management of their networks. The report said the National Cyber Security Centre does not believe the defects identified in Huawei equipment “are the result of Chinese state interference”. The annual report does not suggest the UK networks are more vulnerable than in 2017. A final decision on Huawei’s involvement in the roll-out of the UK’s 5G networks is likely to be part of a government review of the telecoms market and infrastructure, which is due to be published in coming weeks. (Economist) Are lab-grown diamonds the future? Scientists now have the technology to make synthetic diamonds in a laboratory. They are far cheaper than mined stones, but can they replace the real thing? The UK’s plans for building a 5G mobile network are putting national security at risk, Trump officials have warned, as the US urges its allies not to partner with Huawei. Senior US officials warned the UK’s system of testing Huawei equipment would not be enough to ensure the country’s 5G network is secure, the Financial Times reported. The warnings come amid growing pressure from the US, which has told its allies any collaboration with the Chinese tech firm could compromise intelligence sharing agreements. The National Cyber Security Centre (NCSC), which is part of GCHQ, is currently preparing its annual report into the safety of Huawei equipment. While the findings of the report are yet to be published, the NCSC has previously indicated it has not seen any evidence of spying by the Chinese firm. One US official told the Financial Times a significant risk of 5G is that it is based on software, meaning the network can be altered even after the equipment has undergone testing. “One analogy that we can often use is, one minute you’re holding a 5G coffee cup that is transmitting back telemetric data on what the temperature is what the actual liquid is inside. And then the next moment that object can turn into something radically different,” the source said. The official cast doubts over the UK’s programme for testing Huawei equipment, which is carried out at a dedicated NCSC facility in Banbury known as ‘The Cell’. “The mandate that the UK and their Huawei oversight centre has is a purely technical mandate about looking at a piece of equipment that is sitting in front of you,” the person said. The NCSC declined to comment on the report. Earlier this year the spy organisation’s boss, Ciaran Martin, said the UK has “arguably the toughest and most rigorous oversight regime in the world for Huawei”. 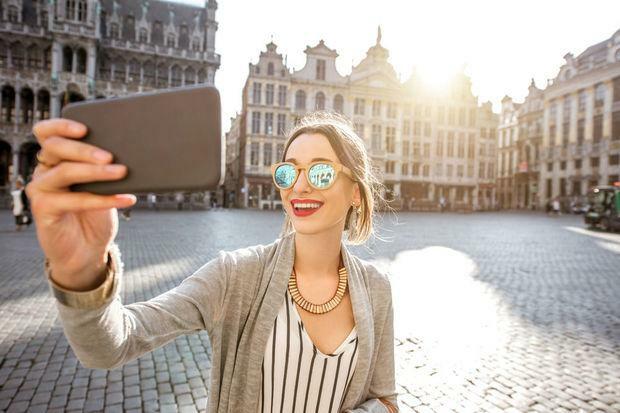 “Huawei’s presence is subject to detailed, formal oversight, led by the NCSC,” he said at a cyber security conference in Brussels. The Trump administration has launched a campaign urging its allies not to use the Chinese firm’s equipment. Secretary of State Mike Pompeo has previously warned that countries using Huawei technology in their 5G networks risk damaging their relationship with the US. The Chinese firm has denied all allegations of spying and accused the US of operating a coordinated smear campaign. Earlier this month the company sued the US government, claiming a law limiting its US business was unconstitutional. Huawei Technologies Co. isn’t a trustworthy partner to build Germany’s fifth-generation mobile networks, a representative of the country’s BND intelligence service told a committee of lawmakers. Past “security-relevant incidents” involving the company are part of the reason, the representative told the committee in Berlin on Wednesday. An official from the Foreign Ministry, speaking at the same meeting, said it would be hard to work with a company that cooperates with its national secret service. The parliamentary press service reported the comments in a statement but didn’t name the officials. “It’s above all a matter of trustworthiness and of the impact on our relationship with our allies,” the Foreign Ministry official told the committee, adding that Germany is in contact with partner nations on the issue. German intelligence officials have been pushing the government to stop Huawei from playing a part in the building of 5G infrastructure in the country, people familiar with the matter told Bloomberg News this month. The officials are concerned that Huawei could help China steal German corporate secrets, the people said. Huawei has repeatedly denied wrongdoing and long maintained it doesn’t provide back doors for the Chinese government, pointing out that no one has provided evidence to support such concerns. An outright ban on Huawei is seen as legally impossible, but German officials are looking at tools that would have the same effect. The U.S. has been pressuring its allies in Europe to ban Chinese equipment in the ultrafast networks being rolled out over spying concerns. Germany’s Bundesnetzagentur regulator said last week that it wants to limit equipment supply to “trustworthy” vendors that comply with national safety regulations as well as secrecy and privacy rules. Germany plans to start an auction of 5G airwaves on March 19, though legal challenges to its design by multiple carriers risk delaying the process. 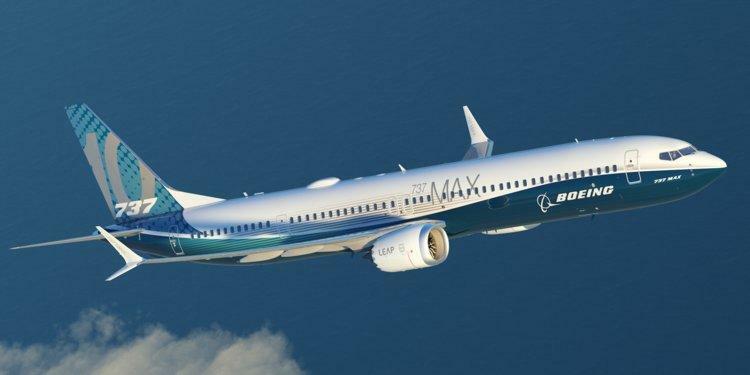 Several Pilots repeatedly warned federal authorities of safety concerns over the now-grounded Boeing 737 Max 8 for months leading up to the second deadly disaster involving the plane, according to an investigation by the Dallas Morning News. One captain even called the Max 8’s flight manual “inadequate and almost criminally insufficient,” according to the report. One captain who flies the Max 8 said in November that it was “unconscionable” that Boeing and federal authorities have allowed pilots to fly the plane without adequate training – including a failure to fully disclose how its systems were distinctly different from other planes. An FAA spokesman said the reporting system is directly filed to NASA, which serves as an neutral third party in the reporting of grievances. “The FAA analyzes these reports along with other safety data gathered through programs the FAA administers directly, including the Aviation Safety Action Program, which includes all of the major airlines including Southwest and American,” said FAA southwest regional spokesman Lynn Lunsford. Meanwhile, despite several airlines and foreign countries grounding the Max 8, US regulators have so far declined to follow suit. 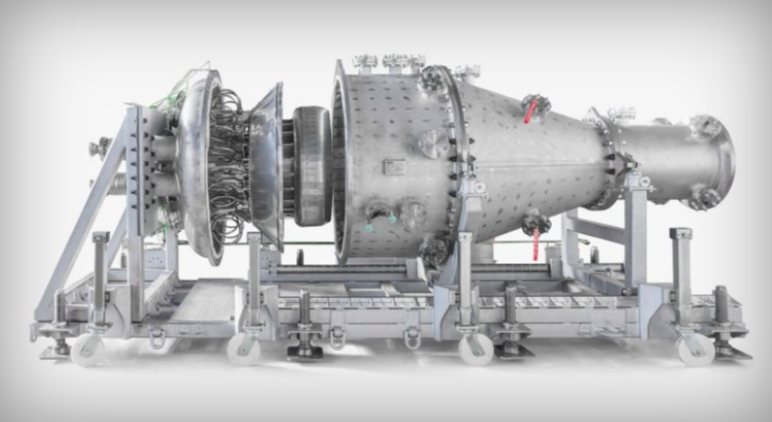 They have, however, mandated that Boeing upgrade the plane’s software by April. Sen. Ted Cruz (R-TX), who chairs a Senate subcommittee overseeing aviation, called for the grounding of the Max 8 in a Thursday statement. “Further investigation may reveal that mechanical issues were not the cause, but until that time, our first priority must be the safety of the flying public,” said Cruz. Qilai Shen | Bloomberg | Getty ImagesRen Zhengfei, founder and chief executive officer of Huawei Technologies, left, speaks during an interview at the company’s headquarters in Shenzhen, China, in January. Major governments including the United States, Japan and Australiahave blocked the Chinese telecommunications equipment maker from providing hardware for next-generation mobile networks known as 5G. The U.S. has said Huawei equipment could provide backdoors for the Chinese government into American networks — a claim the company has repeatedly denied. The Australian government is highlighting a concern on the top of minds of several governments — China’s wide-ranging internet laws, which require tech firms to help Beijing with vaguely-defined “intelligence work,” meaning companies could be forced to hand over network data whether they want to or not. The company strenuously contends that it will not hand over customer data, and Huawei told CNBC that it has never been asked to do so. In an interview last month with CBS News, Huawei’s Ren said the company would never help China spy on the United States — even if required by law. “We never participate in espionage, and we do not allow any of our employees to do any act like that. And we absolutely never install backdoors. Even if we were required by Chinese law, we would firmly reject that,” Ren told the American television network. Sources within China contacted by CNBC declined to comment. But experts from outside the country suggested it would be near-impossible for Huawei to reject a request for data from Beijing. “There is no way Huawei can resist any order from the [People’s Republic of China] Government or the Chinese Communist Party to do its bidding in any context, commercial or otherwise. Huawei would have to turn over all requested data and perform whatever other surveillance activities are required,” Jerome Cohen, a New York University law professor and Council on Foreign Relations adjunct senior fellow, told CNBC by email. “Not only is this mandated by existing legislation but, more important, also by political reality and the organizational structure and operation of the Party-State’s economy. The Party is embedded in Huawei and controls it,” said Cohen, who as a practicing attorney represented corporate clients in China and elsewhere in Asia. The relationship between Huawei and the government has been questioned because of Ren’s past as a former soldier in the People’s Liberation Army and a current Communist Party member. In a question and answer session with international media in January, Ren said that his relationship with China’s ruling party would not stop him from refusing any request from them for user data. “I don’t see close connection between my personal political belief and our business actions we are going to take as a business entity,” Ren said. The problem for Huawei is that there does not appear to be legal recourse if Beijing comes knocking. “The idea of fighting a request of this nature in the courts is not realistic. In truth the law only confirms what has long been true — that one must submit to the Party if called upon. Added to this, a company of Huawei’s size, working in what is considered a sensitive sector, simply cannot succeed in China without extensive links to the Party,” Martin Thorley, an expert on international engagement with China at U.K.-based University of Nottingham, told CNBC by email. “For anyone at Huawei to oppose a serious request from the Party would require bravery bordering on recklessness — what do you do when your adversary is the police, the media, the judiciary and the government?” he added. China’s government addressed the National Intelligence Law during a press conference on Monday. Zhang was responding to reporters’ questions ahead of China’s National People’s Congress, a big annual event where Beijing formally announces major policy elements such as economic growth targets. The comments were made in Mandarin and translated into English by an official translator. Many of China’s largest tech companies have flourished over the last decade within the country in the absence of foreign competition. China has for years blocked some of America’s largest internet giants — on claims that those U.S. companies pose national security risks. The battle between the U.S. and Huawei is bigger than worries over national security risks, according to geopolitical analysts. It’s about who has control of the critical infrastructure that runs 5G. The new network will not only support super-fast mobile internet but it will be the backbone behind other technology like driverless cars. “Huawei involvement in the core backbone 5G infrastructure of developed western liberal democracies is a strategic game-changer because 5G is a game-changer,” Nigel Inkster, a senior adviser to the International Institute for Strategic Studies, told CNBC by email. Inkster, a former senior British intelligence official, explained that China has “embarked on an ambitious strategy to reshape the planet in line with its interests” through its massive Belt and Road Initiative. Its “national telecoms champions” are a big part of that. “Huawei has indeed said that it would refuse any Chinese government request to facilitate espionage. But such a statement simply cannot be taken at face value,” Inkster told CNBC. The Golden State thinks tech companies should share the wealth. It isn’t a secret that tech companies collect your personal data and use it to make a buck. If you don’t like it, stop using Facebook and Google. And the rest of the internet. The idea of paying consumers for their data — either by letting them sell it or by taxing companies for the money made using personal data — isn’t entirely new. Academics have kicked the idea around for decades, and Washington State tried to pass a similar plan in 2017. Newsom’s suggestion, however, is eye-catching because it coincides with privacybecoming a front-and-center issue for many internet users. Calls for tech companies to get our consent to use our data have taken an increasingly urgent tone, putting those companies into damage control mode. Paying users for their data, as Newsom is suggesting, usually isn’t on the table. His talk of a data dividend might change the conversation. Another reason to pay attention to Newsom’s dividend talk: California, the home of Silicon Valley, has some of country’s most advanced data privacy laws. That includes the state’s recently passed data privacy protection law, which aims to give users much broader control over their data, as well as more specific laws that protect schoolchildren’s privacy and prevent employers from requiring workers to hand over passwords to their personal accounts. CNET reached out to several major Silicon Valley companies for comment on Newsom’s remarks. The companies either declined to comment or didn’t respond. While Newsom’s suggestion was open-ended, a bill is very near completion. Common Sense Media, the same organization that spearheaded California’s Student Online Personal Information Protection Act in 2014, has come up with a bill it plans to submit soon. The details of the bill, drafted by Princeton economist Glen Weyl, aren’t public yet. Weyl said in an interview that the bill is unlikely to push for a straight tax on tech companies for using consumer data, nor will it try to create a specific wage companies must pay consumers directly. Instead, he hopes the bill will help groups of people bargain for a good return on the data they’re generating for tech companies. That’s because data isn’t just helping companies sell ads. 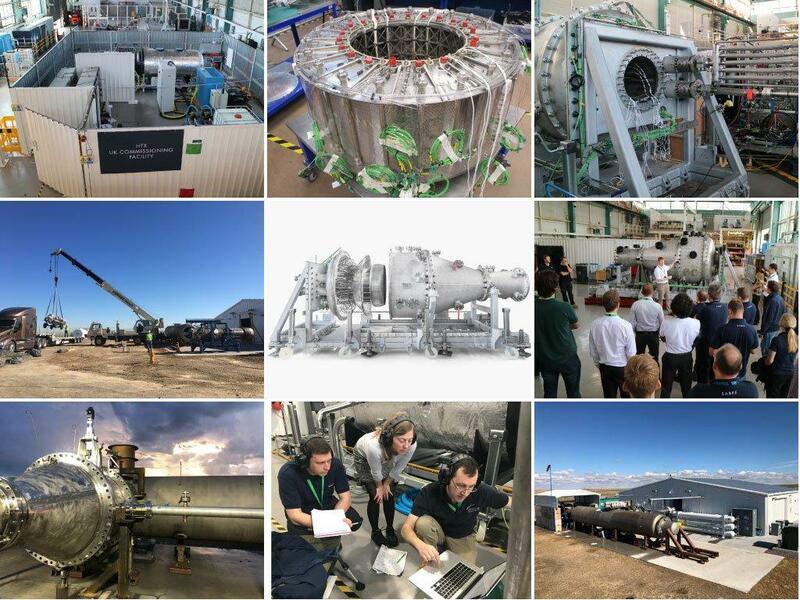 It’s helping them build the tool of the future: artificial intelligence. And once AI starts really taking off, it will earn tech companies a lot of money while putting some people out of a job, Weyl said. The idea of paying consumers for their data first surfaced in the 1990s, when Kenneth Laudon, an economist at New York University, argued that access to consumer data was artificially cheap. Companies sent out junk mail, and consumers and the government paid with time wasted on unwanted letters and subsidized postal rates. Invasion of privacy also prompted feelings of helplessness and lost trust in companies. “The cost of invading privacy is far lower than the true social cost,” Laudon wrote. And that was in 1993. To fix that, he suggested consumers should be allowed sell their data. California might be a powerful place to try the concept IRL. Laws passed in the Golden State tend to set things in motion nationally, like when the state legislators passed the strictest data privacy law in the country in June. That matters throughout the country. In his book Click Here to Kill Everybody, cybersecurity expert Bruce Schneier points out that the toughest state law in the country becomes the de facto federal law for the tech industry, because every tech company has customers in all 50 states. The only thing that can stop a law like California’s is a federal law that supersedes it. 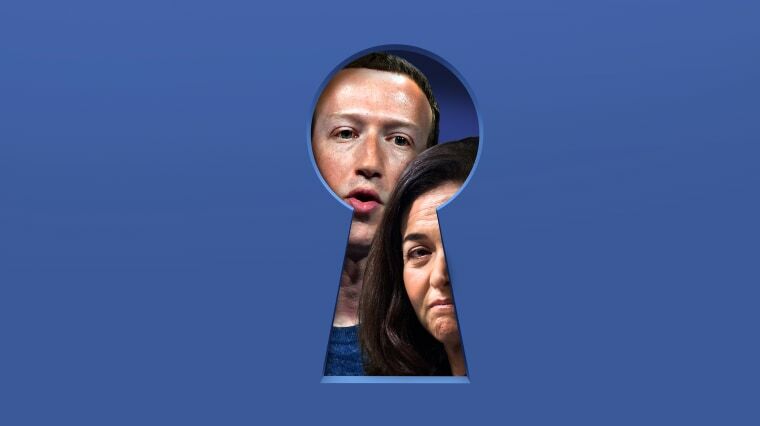 After California’s data privacy law passed, major tech companies including Facebook and Google asked federal lawmakers to pass a privacy law to create a national standard. Several bills have been introduced, but none has passed yet. Some privacy advocates don’t love the idea of a data dividend. They say public policy shouldn’t create incentives for consumers to share data. Rather, it should help them keep their information private. 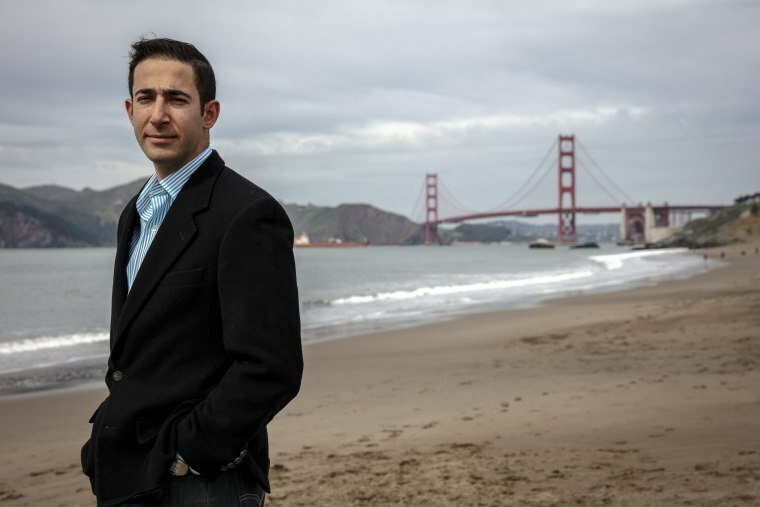 Marc Rotenberg, president and executive director of the Electronic Privacy Information Center, said a data dividend is more akin to a copyright law than a privacy law. Copyright law encourages people to publish their work. Alessandro Acquisti, a professor of information technology and public policy at Carnegie Mellon University, said concerns a data dividend will simply encourage people to share their information are valid, up to a point. Acquisti said there’s no reason Newsom’s soon-to-be-unveiled bill can’t strike that balance. What’s more, a law may be the only way to return the value of data back to internet users. Everything you need to know about the Qualcomm-FTC lawsuit: The antitrust case could decide how smartphones get made in the future — and what they cost. Asked whether the findings changed her country’s stance towards Huawei, the prime minister of New Zealand – which is a member of the Five Eyes intelligence sharing network that includes the UK – said her government would conduct its own assessment. The Chinese telecom giants Huawei and ZTE have been in the Trump administration’s crosshairs as part of a broader focus on Chinese national security threats that has paralleled the ongoing trade war. Trump officials have repeatedly slammed Beijing for its theft of intellectual property and its more traditional cyber espionage. In December, the Justice Department indicted two Chinese operatives for a decadelong campaign of digital intrusions into U.S. businesses and government agencies. And in January, DOJ unsealed a suite of charges against Huawei and its chief financial officer, who faces extradition to the U.S. for violating sanctions on Iran. Many countries are eager to deploy next-generation 5G wireless networks to power the rapidly proliferating internet of things, and Chinese firms such as Huawei and ZTE are aggressively pushing to build these networks — at a lower cost than virtually all of their competitors. 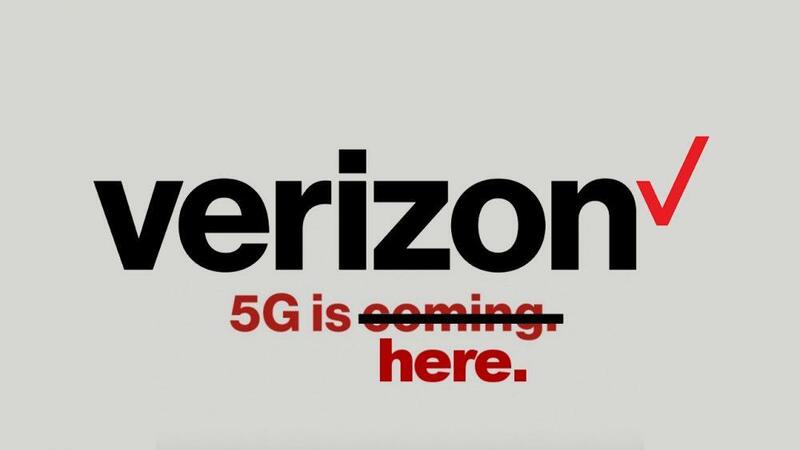 With these 5G build outs looming, senior officials want “to move the needle” with their security messaging, said the source close to the administration. MWC is expected to feature several telecom security meetings, and a second industry source said the U.S. is sending an interagency delegation of at least 20 officials and staffers. Attendees will include FCC Chairman Ajit Pai; Rob Strayer, the State Department’s top cyber official; Strayer’s boss Manisha Singh, the acting undersecretary of state for economic growth, energy and the environment; and Brian Bulatao, Trump’s nominee to be under secretary of state for management. Trump’s telecom directive, which will invoke the International Emergency Economic Powers Act, has been finished for months. As POLITICO first reportedlast August, it was originally paired with a second order formalizing an interagency team that reviews foreign entities’ telecom investment requests. At the time, sources said that Trump would also sign a memorandum explaining how agencies should implement both directives. It is unclear if that will still happen. Concerns about foreign firms helping U.S. adversaries infiltrate sensitive computer systems, whether wittingly or unwittingly, have gained prominence in recent years. After alleged Russian government hackers interfered in the 2016 election, officials increased their scrutiny of the Russian cybersecurity firm Kaspersky Lab, and DHS eventually banned its antivirus products from government systems. DHS has recently taken a lead role in helping to protect the sprawling and often opaque global web of manufacturers and resellers — also known as the “supply chain” — that delivers equipment and software to the U.S. The department created a task force that will, among other things, develop criteria for security assessments, assemble an approved-manufacturers list and advise companies about supply chain threats. In addition, the latest defense policy bill bans agencies from buying and using Huawei and ZTE equipment. Meanwhile, State Department officials are warning their foreign counterparts about 5G security as often as possible. But the U.S. still hasn’t developed an alternative, Huawei-free vision for the massive, complicated and high-stakes global 5G buildout. Trump administration officials are still “trying to understand the full range of options,” John Costello, director of strategy, policy and plans at the Cybersecurity and Infrastructure Security Agency, said at the CSIS event. Right now, the source said, U.S. telecom companies have “no clear guidance on how to proceed” with a 5G buildout that excludes Huawei, which controls 28 percent of the global telecom equipment market. If Trump signs the telecom directive before MWC, the U.S. will be able to attend the conference armed with fresh evidence of its commitment to the issue. At the end of 2017, China banned virtually all materials for recycling. Before that, it took about 60 per cent of the plastic waste exported by G7 countries. That dropped to less than ten per cent in 2018. As the FT’s Leslie Hook explains, finding new ways to deal with recyclables has suddenly becomean enormous challenge. 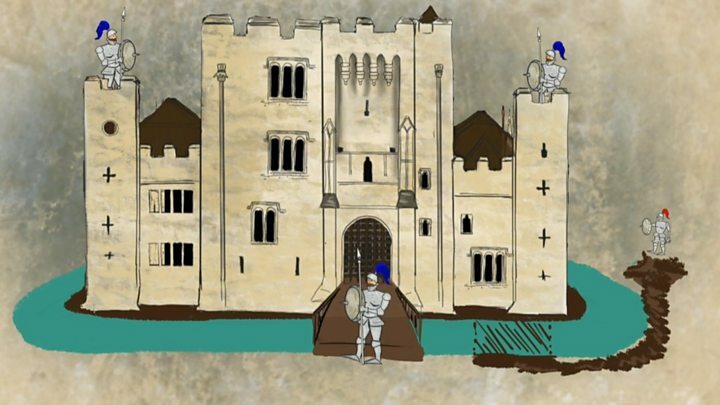 Since ancient Rome animal poisons have been used to heal rather than harm the human body. Scorpion venom can be used to help detect and cure diseases, but milking scorpions by hand is a time-consuming and dangerous process. Now scientists in Morocco are using robots to harvest the venom, which, at $8,000 per gram, is probably the most expensive liquid in the world.